We have New Orleans Children's Party Rentals, Bounce Houses, Spacewalks and more! Fun, Games and Educational Aids for Kids! This category is a collection of websites both in the New Orleans area and around the web that are of interest to children. They include websites with children’s games and fun educational tools from institutions like NASA, PBS and even the FBI and Sports Illustrated. There are children’s educational websites and websites to help children to read. We’ve also added New Orleans area websites for fun children’s activities from swimming lessons and cheerleading to spacewalks and horse back riding. Some of our favorite children’s party services are included such as children’s puppet shows, spacewalks and water slides. Children can learn about the Louisiana Children’s Museum, the only museum in the New Orleans area designed to educate and entertain children. There are a lot of different websites in the ‘For Kids Only’ category. Children and parents in the New Orleans area are sure to find something new, interesting and fun! Whether you are looking for a day care center for infants or college for the older children, the New Orleans Education website categories is a great place to start your research. We’ve collected education websites for schools and colleges throughout the New Orleans area and listed them in convenient categories. For smaller children, we’ve included in these categories websites for child day care, kindergartens and preschools. New Orleans is home to such well known universities as Tulane University and Loyola University in Uptown New Orleans and Xavier University in Mid City. Other centers of higher education in New Orleans include the University of New Orleans and Southern University at New Orleans, Dillard University, Our Lady of Holy Cross College and Delgado Community College. We’ve listed websites for all colleges and universities in the New Orleans area and Southeast Louisiana. We’ve also included websites for local business and trade schools. Where learning is fun! Located in New Orleans, kids can explore and experience more than 100 dynamic hands-on exhibits and exciting educational programs. Children can explore and experience 30,000 square feet of hands-on fun, engaging exhibits and exciting programs. Their website includes information about upcoming exhibits, specials, free days, art programs, children’s camps and outreach programs. Parents can use the website to plan a fun family outing and teachers can get help organizing field trips. The Louisiana Children’s Museum can bring the fun and learning to your classroom with outreach programs. There are many specialty stores for childen’s apparel in the New Orleans area. This category of websites includes New Orleans area stores that specialize in children's clothing, shoes, baby supplies and accessories as well as major department stores with children's departments including Macy’s, Sears, Old Navy, WalMart and Kmart. Also included in the New Orleans children’s apparel category are websites for national chains like Babies “R”Us that cater to the needs of small children, infants and toddlers. There are many independent children’s stores in the New Orleans area that cater to children from infants to young teens. Baby specialty stores offer items such as baby gear, baby gifts, baby showers, baby furniture, crib bedding, baby toys, developmental toys, strollers, high chairs, car seats and much more. About to Bounce for Bounce House and Water Slide Rentals - Metairie - Bounce houses, waterslides, jump houses and party rentals including tables and chairs, cotton candy, snow balls and popcorn machines for your New Orleans Children’s birthday partiesand party rentals. We provide the cleanest and safest inflatables. So, whether you call them bounce houses, jumpers, or bouncers, we know that you will love About to Bounce's HUGE selection! Many fine organizations offer music, dance and theater classes to children in the New Orleans area from the Louisiana Academy of Performing Arts to the Crescent City Lights Youth Theater. The River Ridge School of Dance and Music offers music and dance lessons for children including ballet classes, tap classes, hip hop classes and jazz classes. Children’s music lessons are available for many different instruments from piano and guitar lessons to clarinet and saxophone lessons. Voice lessons are also offered. There are many smaller private classes that specialize in music lessons for children as well as adults. Other popular classes for children are drama and swimming lessons. The category also includes websites for private tutoring for children to develop skills in reading and math. Dance and gymnastics are popular with active children. Young children have lots of pent up energy and perhaps no hobby or activity allows young children more opportunity for fun developmental physical activity than dance and gymnastics. Girls usually have less exposure to sports and physical activities than boys and quickly seize on the opportunities that dance and gymnastics offer. There are many private dance studios and gymnastics programs in the New Orleans area. Most offer children a mix of related physical activities besides dance and gymnastics classes especially cheerleading and tumbling. There are all levels of competition and involvement and a wide variety of programs for interested children. The category also includes dance classes for adults & children of all ages. Planning a party for the kids? When planning a party for the kids, be sure to visit our Children’s Party Services category where you’ll find websites for all varieties of children’s entertainment perfect for that next birthday party or even to entertain the children at weddings. There’s live entertainment for children’s parties like clowns, magicians, face painting, puppet shows and pony rides. You’ll find websites for New Orleans party supply stores and party rentals that supply party items from tables and chairs to tents and spacewalks. One of the most popular entertainment items at children’s parties are the inflatable space walks. Inflatable spacewalks come in all shapes and entertaining themes. Children love to jump and bounce in spacewalks that are designed and decorated to resemble their favorite characters. Spacewalk companies also offer inflatable children’s water slides that a big favorite of children during New Orleans hot summers. 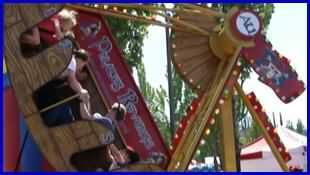 Some of the more unusual children’s party services that you’ll find in this category are outdoor theaters and miniature children’s trains. You’ll also find special food services perfect for children’s parties. The biggest hit at any party for children may be the New Orleans style snowballs and the children’s favorite amusement park foods made fresh with on site popcorn and cotton candy machines. Visit local websites for spacewalks, magic shows, puppet shows, face painting, pony rides, space walks, water slides, kid’s party supplies and more. There are great independent toy stores in the New Orleans area. This category of websites includes major chain toy stores with outlets in the New Orleans area as well as locally owned toy and hobby shops. Independent toy stores are a great place to shop for unique toys that are not always found at the big box stores. If you’re looking for developmental toys that educate while they entertain then visit the websites of independent New Orleans toy stores. Independently owned toy stores in the New Orleans area are also a great place to find top quality toys such as wooden toys that can be passed down for generations. You’ll also find large selections of plush stuffed toys and collectibles like beautiful, hand made dolls and electric toy trains. Independent toy stores are also a great place to find high quality children’s books. 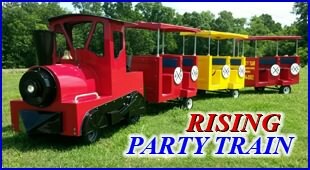 The Rising Party Train is the Largest Party Train in the New Orleans area! Now 2 Party Trains Available! Each Rising Party Train can carry up to 24 kids or 12 adults at a time. Ride the Party Train at Kids Parties, Daycare Centers, Special Events, Family Reunions and More! Rising has Everything You Need for the Perfect Children’s Party! We have Inflatable Bounce Houses, Water Slides, Children’s Carousel, Rocking Cars, exciting rides, Popcorn and Snowball Machines and More, just give us a call! Available in the entire New Orleans area including Metairie, the Westbank, Kenner, Harahan, River Ridge, LaPlace and the Northshore! Finding the right day care or nursery for young children is a challenge for young parents. The New Orleans area has many fine day care centers for young children. Parents have to do their homework and research the many options available before finding the day care center that is right for their children and at an affordable price. This category includes websites for New Orleans area children’s day care centers, nurseries, kindergartens, pre kindergartens and preschool programs. The selection is wide and includes privately operated child care and preschool centers as well as centers operated by New Orleans area churches. Websites for New Orleans Public Schools and private schools that offer kindergarten programs are also included. There are many organizations in the New Orleans area devoted to the healthy development of children from traditional Scouting to organizations which help troubled and needy children. There are organizations that help needy children and their families such as Raintree Children and Families Services and Agenda for Children. Raintree was the only group home for foster girls still operating in New Orleans during the months following Hurricane Katrina. In addition to the group home for girls, Raintree also oversees a private, family foster care program. Agenda for Children was founded to ensure that the basic needs of children and families in Louisiana are met. There are many other organizations such as First Book of Greater New Orleans that helps provide books to local children in need. There are organizations that help troubled teens in the New Orleans area such as the New Orleans Covenant House that offers shelter, health services and guidance to homeless teenagers in the New Orleans area. Other local organizations focus on the development of youth in the New Orleans area. The Beautiful Foundation is focused on the development and education of teenage girls in the New Orleans area. Ladies First Foundation is a nonprofit mentoring and leadership organization that serves as a resource and network of support for young women and girls in the New Orleans area. Boy Scout and Girls Scout organizations offer developmental programs for all youth in the New Orleans area. Physical and mental development as well as personal and community responsibility are stressed in all Scouting programs. Often Scouting is the only means for children living in an urban environment to experience and appreciate the great outdoors. For many urban children, Scouting provides their first experience camping in a wilderness environment, paddling a canoe, learning to swim or even seeing a night sky full of stars.